Jack Nicklaus is clearly an Ohio State man, but he's got family playing in Tallahassee. 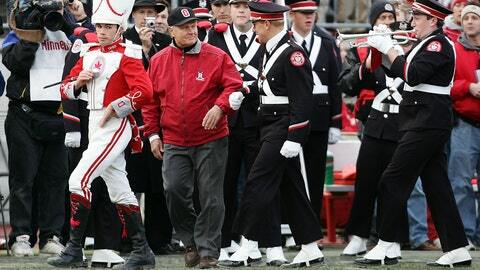 Jack Nicklaus is an Ohio State man through and through. He won an NCAA title for the university in 1961, dotted the "i" on the football field in 2006 with the school’s famed marching band, and an on-campus museum bears his name. Oh yeah, he was born and raised in the Columbus area. But if his alma mater’s football team advances to the BCS Championship Game and faces Florida State, which is currently the only team ahead of the Buckeyes in the BCS standings, Nicklaus will be tomahawk-chopping and chanting with the Seminoles fans. And it has nothing to do with the fact that he also has a home in Florida. "I’m an Ohio State guy, but blood is thicker than anything else," Nicklaus said Sunday night. That would be a reference to his grandson, Nick O’Leary, who is a star tight end for Florida State. The junior has hauled in seven touchdown receptions this year, tied for second in the nation among tight ends. In fact, Nicklaus already has tickets to the college football title game. He bought them more than a month ago at a charity auction, then mentioned the acquisition to Ohio State head coach Urban Meyer. "Urban, I didn’t buy these for Ohio State. I hope you guys get there to play Florida State," he said he told the Buckeyes coach. At No. 1 in all the BCS standings, all FSU has to do is beat No. 20 Duke on Saturday in the ACC title game to land a berth in the BCS Championship Game. At No. 2 in the BCS, all OSU has to do is beat No. 10 Michigan State on Saturday in the Big Ten championship game to book a spot in the national title game — unless a one-loss Auburn or Missouri jumps the Buckeyes (but that’s a debate for another day). So . . . Florida State and Ohio State the only remaining BCS-conference unbeatens. Nicklaus couldn’t be happier for his school — but is happier for his grandson, whose full given name by the way, is Nicklaus.